There are only a few places in L.A. would captivated me to write a review for one dish. Gorbals would be one of those places that steered me from my unbroken rule. Usually, restaurants would have to have more than 1 dish in their repertoire on their overall balance in their menu to stand up for themselves. Hence, I rarely would have just write about one dish for any restaurant. If you are a fan of a reality show on Bravo called "Top Chef", then you may have probably know that the owner and head chef of Gorbals was Top Chef Season 2 winner Ilan Hall. The second season of the show was my favorite because of well crafted editing of the show, the personalities of each of the main contestants, and the creativity of the dishes that was put forward by many of the contestants including Ilan Hall. Honestly, when I heard he was opening up a restaurant in downtown LA, I was thinking more of the line of Spanish cuisine because of his previous employment in New York would dictated that. I was pleasantly surprised by his bold daring move of opening up a Jewish fare borderline with other International influenced cuisines. The cooking at Gorbal is more geared towards rustic home cooking which many of the diners and fans came to love at this place. Some of chef Hall's popular dish were his "bacon wrapped Matzo balls" and his "banh mi poutine". On this particular night, we were going to experience a new dish he presented last fall...his roasted half of pig's head. Needless to say, growing up in a Chinese household, I have only gotten taste of boiled pig's feet or snout that was poured with massive amount of soy sauce. I might even have steamed liver, tongues, or pig's ear, but never the entire head (well, we're getting half of the entire head). You can only imagine how nonplus I am about wanting to try this dish. I just figured it will not cost me that much because I'm sharing the head with 5 other diners that night. Let me start off by saying I was so surprised how well cook the pig's head was. 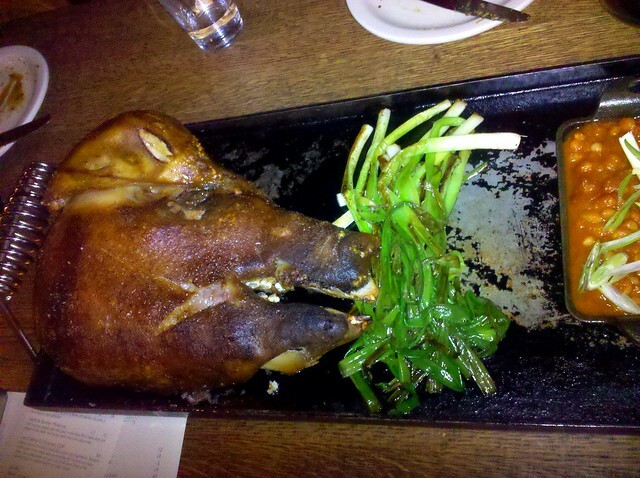 The roasted pig's head was very crispy on the outside, but very tender on the inside. Giving you a perspective, the skin is like the Peking duck, while the meat was moist and tendered like a broilered chicken. There were some seasoning to make the meat more enjoyable because I was definitely expecting a bland pig meat. Our table deconstructed the head from the ear to the snout, with the pig's teeth and eyeball being collected as souvenir. As pointed out earlier, the plate of half of a head was more than enough for a dining group of 6 as all of was stuffed that night. Make sure to order ahead because it will take about 45 minutes for the dish to be prepare. After 4 visits at The Gorbals, I have to put the pig's head dinner as one of more satisfied meal in recent memory. I definitely would go back for the "banh mi poutine" as well and "bacon wrapped matzo balls" have won me over recently. Now, the only question I have for Ilan Hall was that if he was serious about starting a food truck business. If so, will the "banh mi poutine" be on the menu? I doubt the roasted pig's head can be prepared adequately, so I'm hoping for at least one of the two popular dish to survive the food truck venture. One dish doesn't make or break a dinner. However, just for this one unique dish, it can complete a meal.